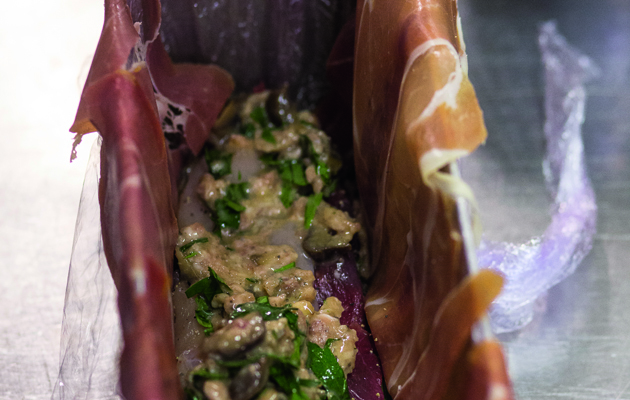 Mark Gough has a delicious game recipe guaranteed to impress. 1. 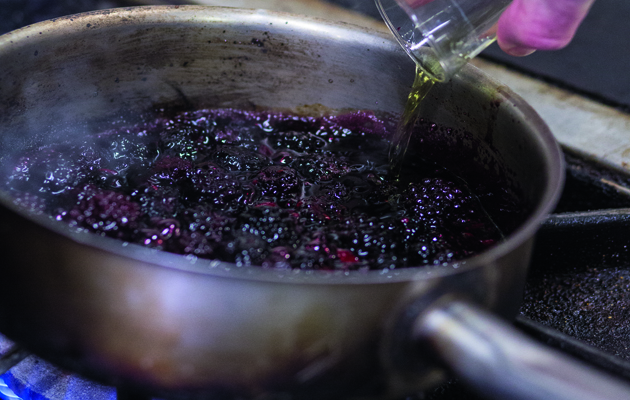 Place the blackberries in a pan, add the chopped chilli. 2. Then add the sugar and simmer for 10 minutes. 3. Drop in the Pernod and simmer until it chickens. 1. Use a loaf tin or terrine dish. Line it with cling film, overlapping the sheets and smoothing them together before putting in the dish. Make sure there is plenty of cling film hanging over the sides. Then line the inside of the dish with the Parma ham, again overlapping it. 2. Cut the duck breasts and fillet them, then cut the various meats into long thin strips. Season with salt and pepper. 3. Skin the sausages and mix with the egg, parsley, brandy and chestnuts and smooth the mix across the bottom of the dish. 4. Firmly push the strips of meat (duck, partridge and venison) on top, alternating the dark and light meat so it is in rows. 5. Fold the Parma ham down and wrap the cling film round so you have a package. Place tin in a bain-marie (baking tray lined with cloth and an inch of water in it) and cook at 140 degrees for an hour. Take out of tin and leave in the fridge overnight. 6. Slice the terrine using a sharp knife, with the cling film still on to hold the shape, and then remove the cling film. Serve with crusty bread and the jam. Enjoy!